Shoulder height 50 - 55 cm / 19,5 -22 inch, weight up to 16 kg / 35 ibs.. They look like the Steenbuck, but with rougher proportions. Like Chamois, Klipspringer walk on their hooves which are covered with a hard rubber like layer, an adaption to their life among rocks. Their yellow-brown hair is long and brittle, serving as padding, all of which are adaptations to their harsh rocky environment. Klipspringer are perfectly camouflaged against granite rock, where they "freeze", perched on a rock for hours on end to outsmart predators. Klipspringer live in rocky mountainous areas and are outstanding climbers, ascending the steepest cliffs. 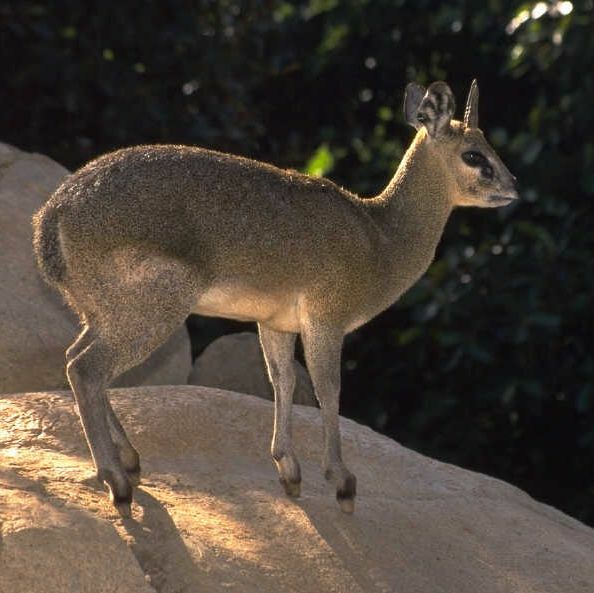 Klipspringer are abundant in the mountainous Naukluft areas, along the escarpment and in the Erongo Mountains and isolated populations in mountainous terrain throughout Namibia. Only the buck carry small horns, rising vertically upwards with pointed tips. The length of horns is up to 15 cm / 6 inch. Old rams usually have worn, horn tips, with pronounced ridging at the base. They normally move in small groups of two to five animals. When in danger, they move upwards against the cliff, usually jumping only from one rock to another to get a better vantage point. One of their characteristics is their remarkable bouncing movement, almost like a rubber ball, when they flee.